As low as $20 for $60 Worth of Vinyl Wall Decals + Free Shipping! 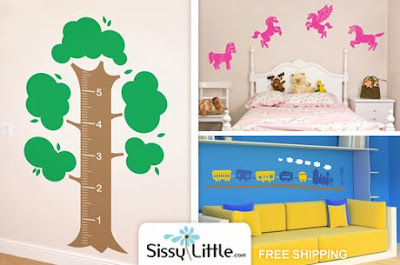 Right now at Eversave, you can get $60 to spend on vinyl wall decals from SissyLittle.com for as low as $20! You'll also get free shipping with the deal! The deal is on sale for $25, but if you're a new Eversave shopper, you'll get $2 credit in your account, making it just $23. Also, use the code CHEERS at checkout to take off $3, making it $20 for new members and $22 for current. The code is available immediately after purchase so you can order your decals right away! I checked out the decal site and there are hundreds of different designs and themes to choose from so you're sure to find something that will look great in any room of your home. Also, prices start at $20 so you could get 3 sets with your purchase!